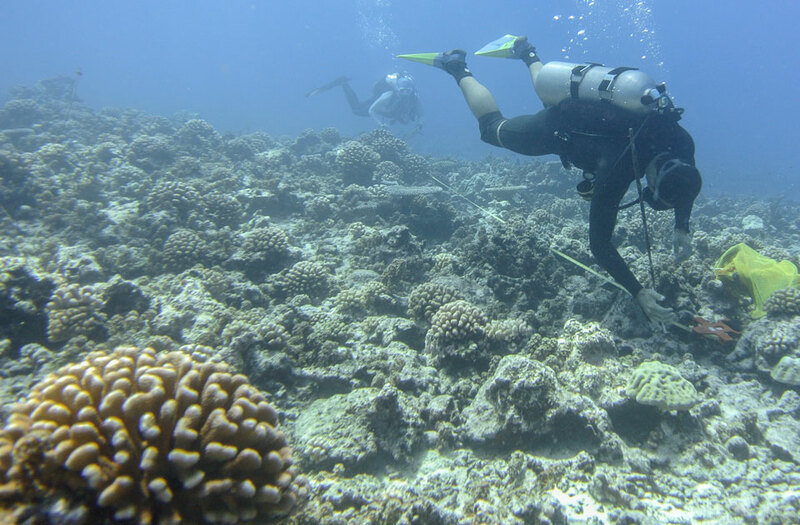 California State University, Northridge technician Sam Ginther and graduate student Megan Williams conducting surveys on the shallow reefs of Moorea in April 2018. Surveys such as these generate the raw data that support the synthetic analyses leading to the “oasis” paper. Photo by Peter Edmunds. Amidst dire reports about the health of the world’s coral reefs, California State University, Northridge marine biologist Peter Edmunds and a team of researchers have found coral reef “oases” that provide hope that all is not lost for these beautiful ecosystems. Edmunds and his colleagues have developed a framework for identifying specific coral reefs, “oases,” in the world’s oceans where corals appear to be thriving. They hope their findings — published todayin the Journal of Applied Ecology — will encourage further study into why these small communities of corals are surviving while so many more are not, and inspire efforts to identify similar oases in other ecosystems. “The reason why these oases are important is because the state of coral reefs over the last 20 years has been increasingly poor,” Edmunds said. “Over the last 12 to 24 months, bad news about coral reefs has appeared at an alarming rate, notably because of the severe coral bleaching that occurred on the Great Barrier Reef due to the 2016 El Niño. The overall message is ‘Oh my goodness, coral reefs all over the world are dying, and many have already gone.’ We felt there was a fragment missing from that story. Dan Thornhill, program director in the National Science Foundation’s Division of Ocean Sciences, which fundeda substantial portion of the ecological investigations upon which this synthetic study is based, underscored the importance of the findings in the journal article. Giant Elkhorn corals (Acropora palmata), such as this colony from about three meters depth in St. John, are some of the most beautiful and important corals that have become lost as many reefs reefs in the Caribbean have degraded. This colony was photographed in 2015 and it was killed by Hurricanes Irma and Maria in September 2017. Photo by Peter Edmunds. The National Science Foundation supported the research described in this study that was completed in Moorea, through the Moorea Coral Reef Long Term Ecological Research site, and in St. John, through its Long Term Research in Environmental Biology program. Edmunds’ co-authors were James R. Guest, Newcastle University; Ruth D. Gates, University of Hawaii; Ilsa Kuffner, USGS St. Petersburg Coastal and Marine Science Center; Andreas Andersson, Scripps Institution of Oceanography at UC San Diego; Brian Barnes, University of South Florida; Iliana Chollett, Smithsonian Marine Station; Travis Courtney, Scripps Institution of Oceanography; Robin Elahi, Stanford University; Kevin Gross, North Carolina State University; Beth Lenz, University of Hawaii; Satoshi Mitarai, Okinawa Institute of Science and Technology Graduate University; Peter Mumby, University of Queensland; Hannah Nelson, CSUN; Britt Parker, National Oceanic and Atmospheric Administration; Hollie Putnam, the University of Rhode Island; Caroline Rogers, USGS’ Wetland and Aquatic Research Center; and Lauren Toth, USGS St. Petersburg Coastal and Marine Science Center. The 18 researchers have extensive knowledge about the conditions of coral reefs in two key regions of the world’s oceans, the Pacific and the Caribbean. With support from the USGS John Wesley Powell Center for Analysis and Synthesisthey spent a year and a half meeting in person and online to synthesize results. They have developed a framework for identifying oases within four coral reef regions that have been studied for decades, in many cases by many of their own team members. Their framework considers the health of coral communities, how often they had been disturbed, and how long they had remained in a healthy (or unhealthy) state. A shallow cora reef (about 10 meters in depth) on the north shore of Moorea, French Polynesia, in April 2018. 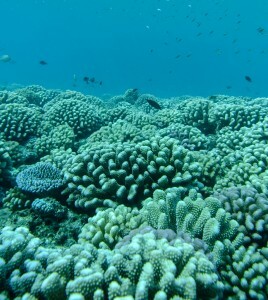 This reef has rebounded from catastrophic damage in 2010 and, as this picture shows, part of the sea floor are almost fully covered by live coral. Photo by Peter Edmunds. Working together, the researchers were able to identify 38 oases that they categorized as either “escape,” “resist,” or “rebound” oases. Escape oases are coral communities that have been able to avoid disasters such as bleaching, invasions from coral-eating sea stars or the wrath of hurricanes. 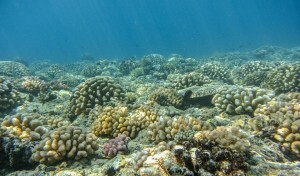 Resist oases are coral communities that appear hardy and resistant to environmental challenges. Rebound oases are coral communities that have suffered damage like many other reefs, but have “rebounded” to a coral-dominated state. 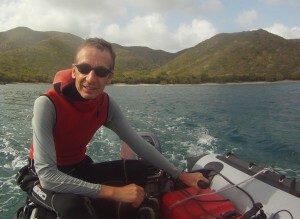 Edmunds, who studies coral reefs in St. John, U.S. Virgin Islands (in the Caribbean), and in Moorea, French Polynesia (in the Pacific), said he has been “blown away” by the capacity of the reefs in Moorea to rebound following devastation. 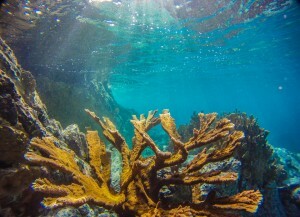 Given the 38 oases the researchers have identified, Edmunds said it is logical to assume that there are more coral oases in the rest of the world’s oceans. By definition, Edmunds pointed out, an oasis is a rare occurrence in a dire landscape. “There are a small number of examples of healthy reefs amidst an otherwise dark landscape of dying corals in the world’s ocean,” he said. “This project was an effort to see where these sites could exist, and whether coral within them could withstand present-day stressors. We spent a lot of time working on this, and we are optimistic that our coral reef oases are signs of good things in the future, rather than the last gasp of a dying ecosystem. A shallow coral reef, about eight meters deep, on the north shore of Moorea, French Polynesia, in April 2018. This reef has rebounded from catastrophic damage in 2010 and in places now has about 70 percent of the sea floor covered in live coral. Photo by Peter Edmunds. Edmunds said he hopes the journal article will provide conservationists and policy makers with a tool that can be used to identify areas that warrant stronger protection. “Our method for detecting oases provides a way to demonstrate that select areas are environmental gems deserving of greater protection,” he said. “Countries all over the world have marine protected areas and parks, and they all face the dilemma of where to locate them and how best to allocate limited resources to protect them. The identification of ecological oases promotes a healthy consideration of the effectiveness of protecting a single species versus areas of ecosystem in which they live; if oases are persistent they might offer the best chance for many species of animals and plants to survive. “I don’t think the solution to our current environmental challenges is building a Noah’s Ark, and wrestling with which species to protect and which to leave to extinction,” he said. “Identifying and protecting ecological oases, such as the ones on coral reefs we describe in our new paper, offers a more realistic opportunity to protect swaths of intact ecosystems that might be able to catalyze broader ecosystem recovery.